The Arkansas Governor's Work-Life Initiative has recognized Garver for establishing and providing resources that encourage employees to balance work, family, and health. 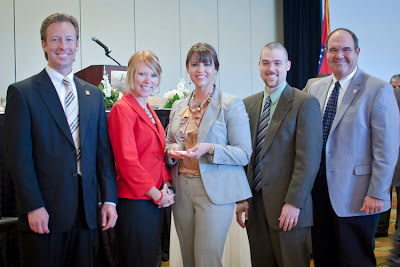 Garver received a Spotlight Award for offering unique programs that address the needs of employees and their families. In addition to the health and wellness benefits Garver provides, our company has created a pro-bicycling atmosphere within the business culture. "This award validates our efforts to provide a healthy work-life balance for our employees," said Tatiana Herrington, director of human resources. "Healthy living and family time are important to our company's vision, and we've diligently worked to offer quality benefits and programs." Accepting the award included Senior Vice President Chad Clinehens, Controller Beverly Green, Director of Human Resources Tatiana Herrington, Corporate Editor Jon Hetzel, and Senior Vice President Bert Parker. Garver's employees support and motivate each other to achieve a healthy lifestyle at work and at home. This atmosphere has created a pro-bicycling environment. Integrating bicycling into the business culture has included participating in National Bike to Work Week activities: from May 14-18, several Garver employees are organizing bike maintenance services and leading convoys to company headquarters in North Little Rock. Other activities include posting rides and races on the corporate blog and providing loaner bikes, secure bicycle parking and showers to encourage employees to fit rides into their daily routines.